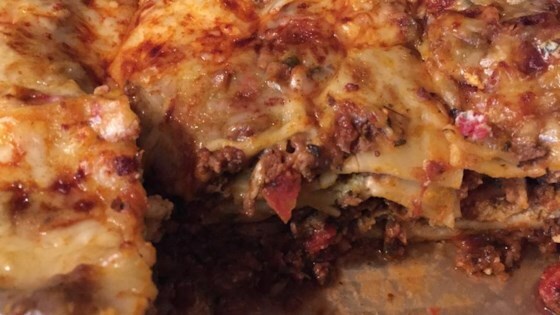 "This recipe is adapted from several of the better lasagna dishes previously submitted. To test it, I invited a couple who previously owned an Italian restaurant. They were very impressed. This lasagna dish will become a regular in our household. In this dish I used a spicy moose sausage; you can use pork, deer, moose, lamb, or any other spicy sausage. To be enjoyed with a mixed salad, Italian bread, and a delightful red wine." Bring a large pot of lightly salted water to a boil. Cook lasagna in the boiling water, stirring occasionally until cooked through but firm to the bite, about 8 minutes. Drain and rinse in cold water. Cook and stir sausage, beef, onion, and garlic in a large, deep skillet over medium heat until browned. Stir tomato basil sauce, tomato sauce, diced tomatoes, 3/4 cup parsley, Italian seasoning, sugar, sea salt, and pepper into sausage mixture. Bring to a simmer; reduce heat to low and cook, stirring occasionally, until flavors blend, about 30 minutes. Stir ricotta cheese, Parmesan cheese, Cheddar cheese, eggs, and remaining 1/4 cup parsley together in a large bowl until smooth. Spread 1 cup tomato sauce in the bottom of the prepared baking dish. Cover sauce with a layer of lasagna noodles and spread the ricotta mixture over the noodles. Spread a layer of tomato sauce over the ricotta and a layer of noodles over the tomato sauce. Repeat the layering procedure 1 more time. Spread remaining sauce over the final layer of noodles and top with mozzarella cheese. Cover baking dish with aluminum foil. Bake lasagna in the preheated oven until hot throughout and bubbling, 30 to 40 minutes. Remove the aluminum foil and bake until cheese is golden, about 10 minutes more. Cool for 10 minutes before serving. Thank you for posting your recipe. I searched for one I felt most like our favorite restaurant serves. All our family agreed the flavor was tops. My Italian family says that this is the best lasagna they've ever had. Quite a testimonial. Unfortunately, I am now the designated lasagna maker for every family occasion.